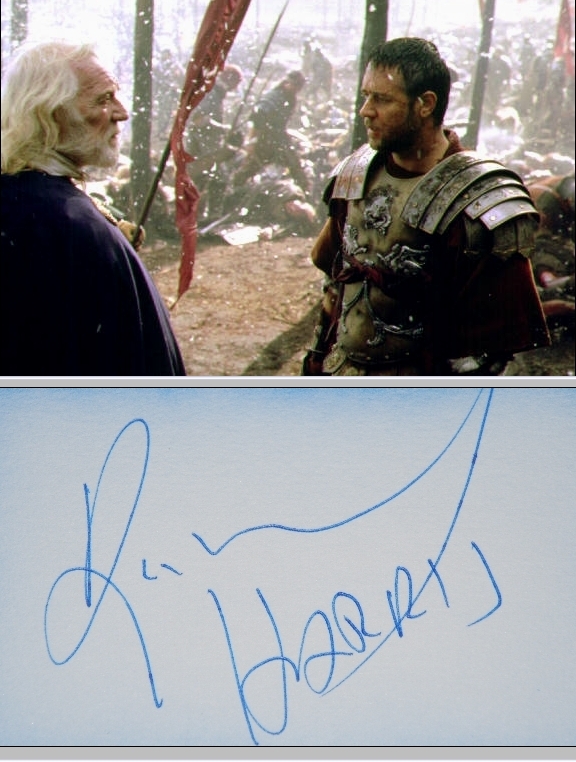 Richard Harris GLADIATOR / CROMWELL signed autograph page. genuine star of cinema on screen and a fiery hell raiser off screen, Richard St John Harris was born on October 1, 1930 in Limerick, Ireland, to a farming family. He was an excellent rugby player and had a strong passion for literature. Unfortunately, a bout of tuberculosis as a teenager ended his aspirations to a rugby career, but he became fascinated with the theater and skipped a local dance one night to attend a performance of "Henry IV". He was hooked and went on to learn his craft at The London Academy of Music and Dramatic Art, then spent several years in stage productions. 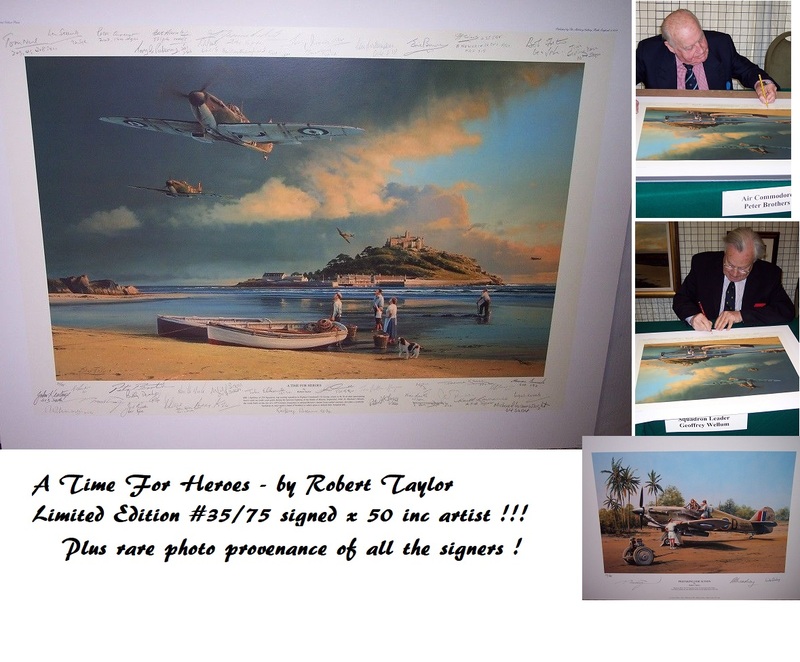 He debuted on screen in Alive and Kicking (1959) and quickly scored regular work in films, including The Wreck of the Mary Deare (1959), A Terrible Beauty (1960) and a good role as a frustrated Australian bomber pilot in The Guns of Navarone (1961). However, his breakthrough performance was as the quintessential "angry young man" in the sensational drama This Sporting Life (1963), which scored him an Oscar nomination. He then appeared in the WW II commando tale The Heroes of Telemark (1965) and in the Sam Peckinpah-directed western Major Dundee (1965). He next showed up in Hawaii (1966) and played King Arthur in Camelot (1967), a lackluster adaptation of the famous Broadway play. Better performances followed, among them a role as a reluctant police informer in The Molly Maguires (1970) alongside Sir Sean Connery. Harris took the lead role in the violent western A Man Called Horse (1970), which became something of a cult film and spawned two sequels. As the 1970s progressed, Harris continued to appear regularly on screen; however, the quality of the scripts varied from above average to woeful. His credits during this period included directing himself as an aging soccer player in the delightful Bloomfield (1971); the western The Deadly Trackers (1973); the big-budget "disaster" film Juggernaut (1974); the strangely-titled crime film 99 and 44/100% Dead (1974); with Connery again in Robin and Marian (1976); Gulliver's Travels (1977); a part in the Jaws (1975) ripoff Orca (1977) and a nice turn as an ill-fated mercenary with Richard Burton and Roger Moore in the popular action film The Wild Geese (1978). However, the luck of the Irish was once again to shine on Harris' career and he scored rave reviews (and another Oscar nomination) for The Field (1990). He then locked horns with Harrison Ford as an IRA sympathizer in Patriot Games (1992) and got one of his best roles as gunfighter English Bob in the Clint Eastwood western Unforgiven (1992). Harris was firmly back in vogue and rewarded his fans with more wonderful performances in Wrestling Ernest Hemingway (1993); Cry, the Beloved Country (1995); The Great Kandinsky (1995) (TV) and This Is the Sea (1997). Further fortune came his way with a strong performance in the blockbuster Gladiator (2000) and he became known to an entirely new generation of film fans as Albus Dumbledore in the mega-successful Harry Potter and the Sorcerer's Stone (2001) and Harry Potter and the Chamber of Secrets (2002). His final screen role was as "Lucius Sulla" in Julius Caesar (2002) (TV).